Make 20 strip sets that are print-neutral-print (p-n-p) and 10 sets that are neutral-print-neutral (n-p-n). Press all seams open. If you want to make a different size, just remember you will need double the number of (p-n-p) sets. So if you make 30 p-n-p sets, you will need 15 n-p-n sets. Cut each p-n-p and n-p-n strip into (6) 3" set. You should now have (120) 3" p-n-p sets and (60) 3" n-p-n sets. Randomly sew two p-n-p and one n-p-n together, with the n-p-n in the middle to make (60) 9 patch blocks. Press all seams open. If you make alternate sizes, remember you will always need equal numbers of 9 patch blocks and neutral 8" squares. Then, just alternate 8" neutral squares with your 9 patch blocks. Voila! Super quick and easy Irish Chain quilt! I have to thank my friend Stephanie for coming up with the clever title to my post! Thanks girl! This was just gorgeous! Think I fell in love with Glimma as well, it hasn't caught my eye or heart before, but this.... ! Love the layout, the colors.... Well all of it!!! That's brilliant! I'm tagging this for future reference! Love it; I would get it really grubby, really quickly, but I still love it! Excellent, and thanks for the tips! 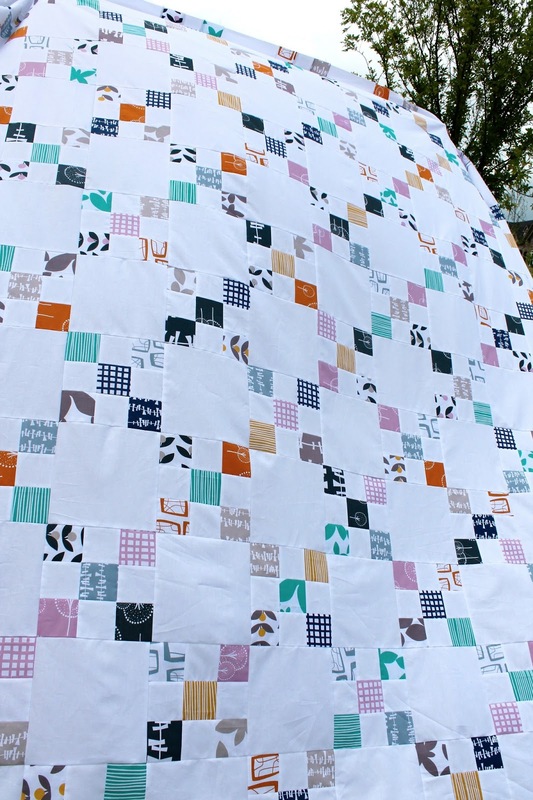 Such a lovely quilt - love the light Colors here! This is beautiful Kelly! I've been thinking about the old irish chain lately. Might have to put it on my list! This pattern has been on my to do list since I first saw it, thanks for the tutorial. Your quilt is lovely, beautiful colours! I'm trying this for sure! It looks awesome! Very clear concise instructions! Would love to do this with strips from my purple stash! Really love how the Glimma works in this, beautiful quilt top! I'm in love with this one, Kelly! And I feel kind of like a dunce that I never realized how simple an Irish chain could be! Love the quilt, Kelly, but especially your method. I've been struggling with the Irish Chain for years. You make it so do-able. Thanks! This is GORGEOUS!!! You are freaking amazing! I love your quilt! Thanks for sharing a wonderful pattern and tutorial! I will be making this for sure. Have a great day!